I’m not really into eating chicken for breakfast. In fact, I don’t remember the last time I ate chicken in the morning. Actually, I take that back. I did have chicken sausage links for Sunday brunch. I appreciate that meal planners are changing it up and not serving the beef all the time. I want to take pictures of all of the breakfasts I see, but I’m not going to take a picture every day because it’s too intrusive. Breakfast is served to the kids at the same time while lunch is staggered over several shifts. Breakfasts are eaten all over the school while school lunch is eaten in the cafeteria. There are two different choices, one hot and one cold, for breakfast while at lunch there is one main hot entree. 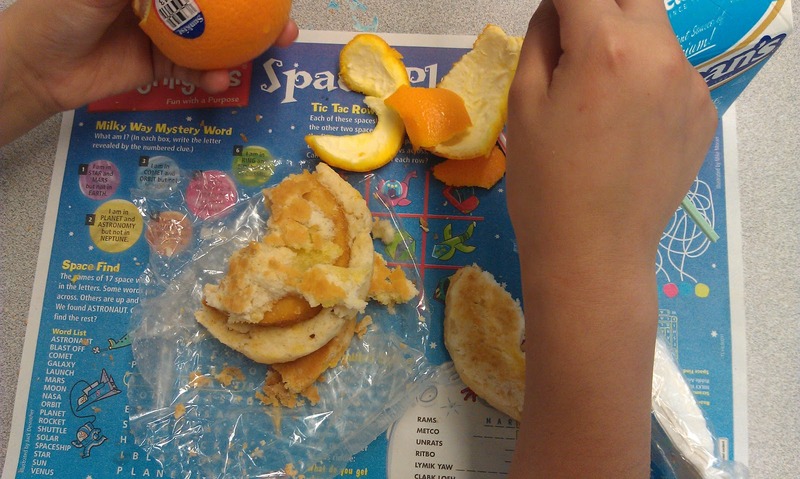 Breakfast in the classroom generates a lot of waste. Each classroom fills up and throws out one large garbage bag every morning. That adds up quickly. I haven’t seen any cockroaches since the start of the breakfast program, but I have seen cockroaches in my school in the past. In my room I’ve seen cockroaches on two occasions. First I saw a dead one. (I just shivered) Then about a year later I saw one that was moving slowly across the floor. (I shivered again) Anyway, I’m a wimp and I had to get a coworker to help me get rid of it. One of my coworkers once saw cockroaches coming out of a student’s backpack. I’m telling you this only so that you know that bugs have been a problem, but I think most classrooms are taking precautions to be as clean as possible with the students’ breakfasts. I still feel good about the program because I know I need to eat something for breakfast or I’m not good for much. I think the chicken is fine, but the biscuit…those are so fatty. Um, is the chicken a preformed processed chicken patty (with lots of other things besides chicken) similar to a giant McNugget or is is really chicken with a light breading? I could see incorporating chicken into breakfast in the form of a chicken sausage (although I doubt the good ones, "al fresco", are within the schools budget since I can only afford them when they are on sale with a coupon), but I don't think kids need McNuggets for 2 meals in one day. oranges are a pain to peel, though they are a great breakfast fruit. Maybe those small, easy peel clementines would be a better option? I prefer those for my kids, because they can peel them by themselves. Yay, chicken biscuits! Those are a big southern breakfast staple. I certainly agree with Anonymous's concern that the chicken might be the same sort of formed "pink slime" patty that the average nugget is made out of, but there's nothing wrong with a chicken biscuit on general principle. To me, this seems like a huge step up from a danish or Pop Tart or other pastry featuring sugar and fat. There's some grain, some protein, and some fruit. I just deleted a comment by mistake! Stupid phone – I'm sorry to "anonymous"
I firmly believe in breakfast at school. I am a preschool teacher and breakfast is just a part of the daily schedule. The children get to choose if they want to eat or not, if they are hungry. I teach in a very poor area, so almost all of the children choose to eat. At my school, food is provided, but it is up to each of the teachers to prepare breakfast for her class. It's nothing major: cereal, bagels, toast, string cheese, milk, and juice. But, it's enough to power up the kids for the day. "I just deleted a comment by mistake! Stupid phone – I'm sorry to "anonymous" "
Then I think I asked you whether kids get a chance to wash their hands after breakfast (I imagine they get very sticky/greasy). I love that they are getting a breakfast and also agree fruit that is appropriate for them should be served. What about English muffins instead of biscuits?